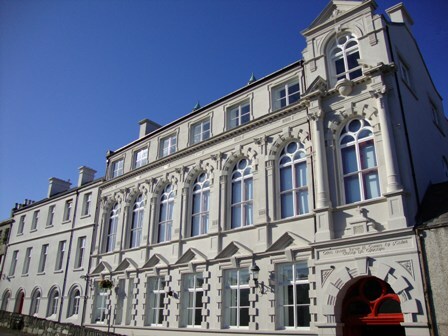 Built in 1911 by E J Toye, St Joseph’s Primary School lies within the historic Walled City Conservation Area. In 1986 an application to demolish the buildings was refused and they are now B1 listed. Featuring in Volume 6 (1999) of the Buildings at Risk series, the group of buildings still found themselves vacant and in great need of refurbishment. In the 1990’s Pauline Ross (The Founder of The Playhouse) had a vision to rescue the buildings. 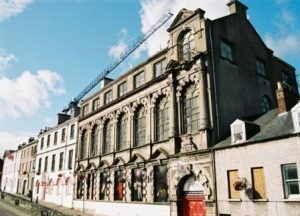 The building featured as one of Northern Ireland’s ‘star turns’ in the 2004 BBC ‘Restoration’ television series and won the regional heat, carving the way for their restoration and reuse. 2007–2009 seen a full restoration of the building by Blonski Architects, transforming it into The Playhouse award wining arts and entertainments venue. 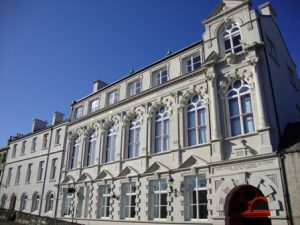 The school opened in 1911 with a play being performed in the new hall– the same space where, 100 years later, plays are performed daily as part of The Playhouse arts and events programme. £4.6m restoration project, funded by: Arts Council of Northern Ireland; Heritage Lottery Fund; NIEA Listed Building Grant Aid; Department of Culture Arts and Leisure; ILEX; Department of Enterprise Trade and Investment; Internation Funds for Ireland (IFI); AdaptNI; Ulster Garden Villages; NITB; the Honourable the Irish Society; the Weston Foundation and the Playhouse funds.